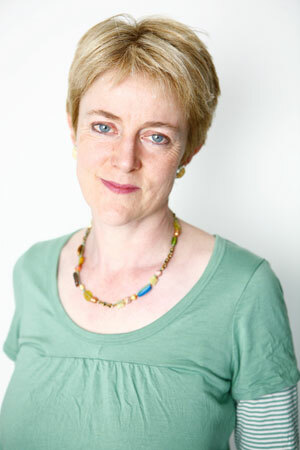 Following a brief career in medicine, Lissa Evans spent five years as a producer in BBC Radio Light Entertainment. She then moved to television where her credits as producer/director include Room 101, Father Ted and The Kumars at Number 42. She has written books for both adults and children. Stories add an extra dimension to life: – if you read stories, then the most ordinary object can have a dozen meanings and every staircase can lead to fifty different destinations. Storytelling is like having a kaleidoscope in your pocket. What’s one thing that readers would be surprised to find out about you? I used to be a medical doctor. In one of my jobs, I spent quite a few months looking after teeny, tiny babies in the premature baby unit and ever since then, ordinary babies have always looked enormous to me: - a bit like Mr Stay Puft, the marshmallow man in the film Ghostbusters. When did you write your first book and how old were you? I was 39 and the book was called ‘Spencer’s List’. I’d always wanted to be a writer, but I kept getting side-tracked; after being a doctor, I became a radio director and then a television comedy producer – and then at last I decided to clear a great big space in my life and sit down and do what I’d always really, truly wanted to do. It was a wonderful feeling. What was the greatest thing you learned at school? No matter how difficult life is, you can always escape into a book. 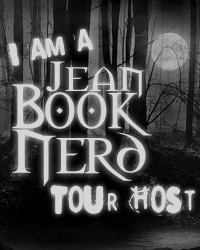 In your new book; Horten's Incredible Illusions: Magic, Mystery & Another Very Strange Adventure (Stuart Horten #2), can you tell my Book Nerd Kids Community a little about it and why they should read your novel? For those who are unfamiliar with Stuart Horten, how would you introduce him? Stuart’s 10, small for his age and an only child. His mother’s a hard-working doctor and his father is excessively fond of sesquipedalia (long words) and when the family moves to the dreary town of Beeton at the beginning of the summer holidays, it seems possible that Stuart will die of boredom by the end of the week. Then he meets the identical triplet sisters (aged 10, tall for their age) who live next door, and things get even worse. If you could introduce Stuart to any character from another book, who would it be and why? Milo, from ‘The Phantom Tollbooth.’ I think Stuart would just love the whole journey, and dreamy Milo would benefit from Stuart’s very practical, straightforward approach to life. If you had to choose, which writer would you consider a mentor? I’d choose George Orwell, who wrote ground-breaking fiction and non-fiction in beautifully clear and vivid prose. ‘1984’ is still one of the most chilling novels ever written, and incredibly easy to read, and ‘Down and Out in London and Paris’ is a funny, sad, rivetting account of a year spent living in poverty. Orwell said that good prose is like a window-pane – I always try to remember that when I write. What's the best summer job you've ever had? Picking strawberries; I ate most of them. I’m more of a worrier than a scaredy-cat. I wake up at night fretting about pathetic little things which dwindle to nothing in the morning light. What is your greatest adventure? My greatest ever adventure was turning up on my own at a remote Kenyan village at 11pm one night to find that the friend I’d come all the way from the UK to visit wasn’t actually there. I don’t think that there were any lions in the vicinity, but I imagined quite a few…. when was the last time you told someone you loved them? Last night, both children (just after telling them off about leaving their bedroom in a HUGE, APPALLING mess). Who is the first person you call when you have a bad day? My friend Kate, who is very wise, has 4 kids, shouts a lot, lives in the middle of nowhere and is the funniest person I know. Her text messages should be published in a 10-volume series, for reading when you feel miserable. Watching the end of a film called ‘Millions Like Us’ which was made over seventy years ago. I’ve seen the film at least ten times, and I’ve cried every single time. Where can readers stalk you? The London Library, where I go to write. On sunny lunch-times you’ll find me eating sandwiches with my library friends under the shady plane trees of St James Square. Stuart Horten (ten, but looks younger) is now the owner of a magician's workshop - except that without his Great-Uncle's Last Will and Testament, he can't actually prove it.Which is a problem, since someone else wants it as well; someone who has a lot of money. The workshop contains seven magnificent stage illusions, but when Stuart starts to investigate them, he discovers that each is the gateway to a magical adventure, with a puzzle to solve, and a clue to extract. As the clues mount up, the adventures become riskier. Friendship is strained, and danger looms and Stuart has to decide what sort of prize he really, truly wants. 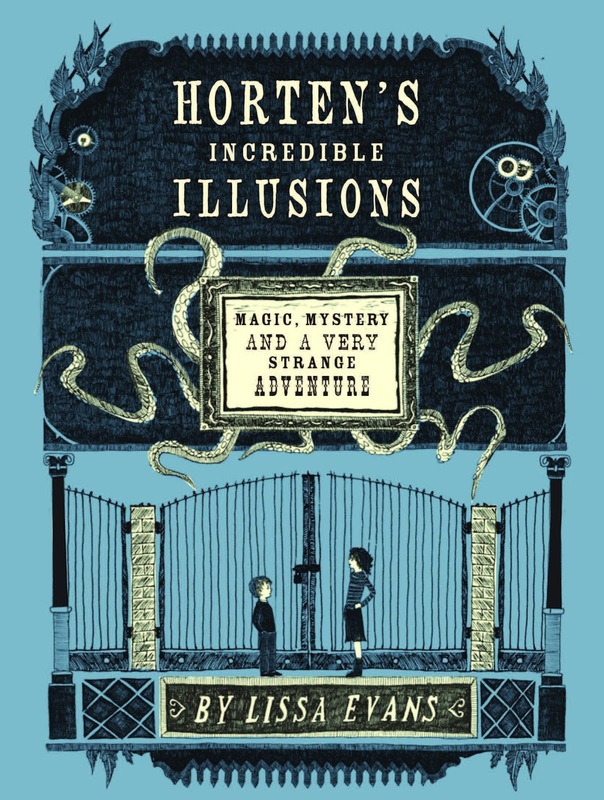 Horten’s Incredible Illusions is the fantastic follow-up to the delightful Horten’s Miraculous Mechanisms by Lissa Evans. Just like the first adventure of Stuart Horten, this was just as wonderful. Stuart realizes that the illusions he found within his great-uncle Tony’s workshop may be harder to keep. Since it is built on public land, they essentially belong to the village council. Only if Stuart is able to produce his great-uncle’s Will, he can prove that the shop belongs to him. Soon he learns that the illusions in the workshop leads to his Will and whoever finds these important documents will become the new owner. The puzzles and mysteries in Stuart’s first adventure were truly mind-boggling and in the second book, they are moved a notch or two up. The element of a scavenger-like hunt to the mystery will have readers entwined to its web-like tangles of enigmatic adventure. Lissa’s writing style will place readers in a front row seat through all of the magical places Stuart goes through as he tries to unravel the puzzles that will lead him to clues towards his great-uncle’s will. This is the kind of book that ignites fire into the minds of young readers and it will be a bright display of fireworks. It was a nice to see secondary characters more involved like Stuart’s dad and the triplets. Character development provided much depth to the story. Lead by Lissa’s strong imagination, Horten’s Incredible Illusions will have the gears inside readers’ minds grinding in full motion and continue well after it is read. Thank you Lissa & Katie for making this giveaway possible. 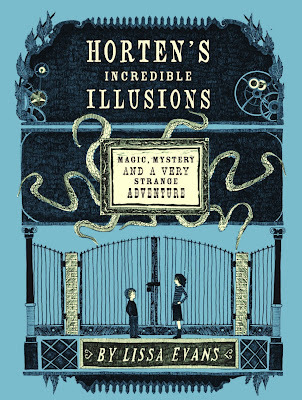 1 Winner will receive one copy of Horten's Incredible Illusions: Magic, Mystery & Another Very Strange Adventure by Lissa Evans. I wake up. I take a shower, I brush my teeth, drink a cup of tea an then I go to school. I came back home, sometimes I go out with my friens or I just do my homeworks and read a few pages from a book. Then I go to sleep. Wake up. Chase my tail. Eat. Get brushed. I get up, look at Facebook and my email for university admissions, go to school, eat breakfast, go home, do homework, drive me sister to swimming, go do more homework, then read for about an hour before bed. Wish I had more time to read! I wake up, I wash up and go outside with my dog for the morning run feed her, clean her, do some chores around the house, eat, school, outside with the dog again, reading, walk the dog, reading, sleeping :))) pretty much my day! My life is very boring! But usually its getting up early to get my son off to school. Then I jump on the computer and check my emails and then visit my favorite blogs, like Jean's!! And sometimes my daughter will drop off my beautiful 1yr old grandson and that is the highlight of my day when I do get to see him. And then I run errands if I have some. Then dinner, get my son to bed and jump back on the computer. I usually wake up at 4 a.m. and take a pray, sit in front of computer checking stuff, take a shower, go to wherever I need to go (class/work), go home usually around 4-5 pm, take a shower and pray, watch TV or chat with my parents, take a pray, dinner, do stuff like homework or watch movie or read a book or go online, then go to sleep usually @10. On and on. Wake up early, send the husband to work and get the kids on the bus. Then drink a cup or two of coffee while catching up on FB, reading blogs and reading the news. Clean, run errands, do school work, read if I have time. Some days I substitute teach, which means I spend most of my day reading.